The MCMUA is pleased to provide its Annual Drinking Water Quality Report in PDF format. The annual reports indicate data about the water the MCMUA produces from its groundwater system or for water it purchases from the Southeast Morris County Municipal Utilities Authority (SMCMUA) and mixes and incorporates into the MCMUA water system. MCMUA 2018 Annual Drinking Water Quality Report - This report includes the water quality monitoring results from the Morris County MUA for resuults from year 2018 for the year 2019. MCMUA 2018 Annual Drinking Water Quality Report - This report includes results from water sample monitoring sampling performed by Southeast Morris County MUA (SMCMUA) on their surface water source. 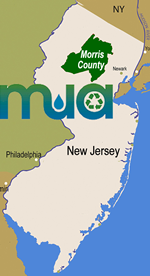 Water that you purchase from the Morris County MUA is SMCMUA surface water from their Clyde Potts Treatment Plant. The results of the report are from the year 2018 for the year 2019. Please call 973-285-8383 or email info@MCMUA.com with any questions or comments.